I am slightly obsessed with salted caramel. Homemade of course. I can't get enough of it lately. Last weekend I was trying to come up with something new to make for dessert when we had the grand-kids overnight. 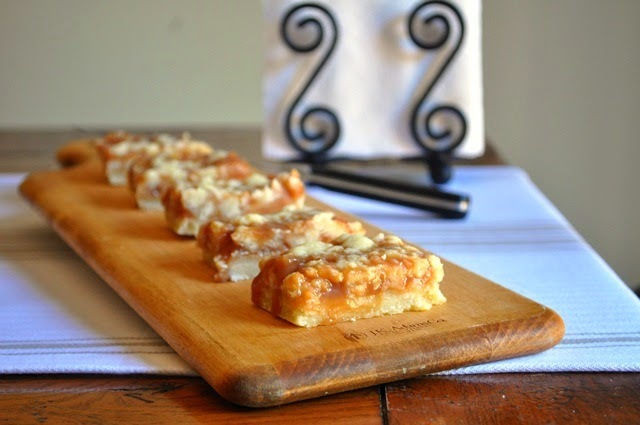 I spotted the salted caramel sauce I had in the freezer and these bars came to mind. I had the 4 year old take a lick of the caramel sauce and she said she didn't like it. Uh oh. But, I decided to forge ahead in hopes she'd like the finished product. Make the caramel sauce and set aside. Preheat oven to 325, line an 8 x 8 baking dish with aluminum foil and spray it with cooking spray. In a large bowl cream the butter and both sugars together. Stir in the vanilla. Add the flour and mix it until a soft dough forms. Press half of the dough into the bottom of the baking dish and cook for 15 minutes. Place the other half of the dough in the refrigerator while it's cooking. 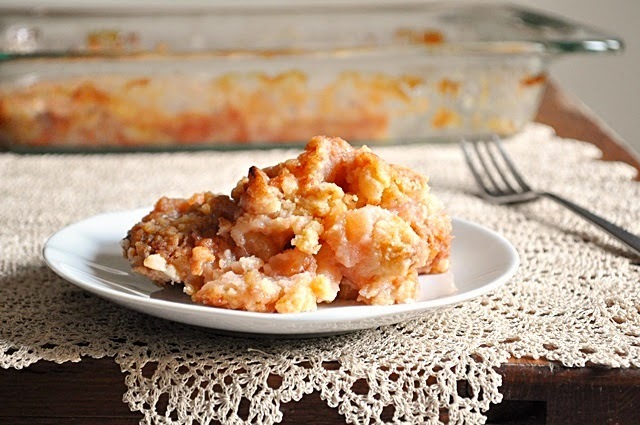 Remove from oven and pour about 1 cup of the caramel sauce into the baking dish on top of the partially cooked dough. 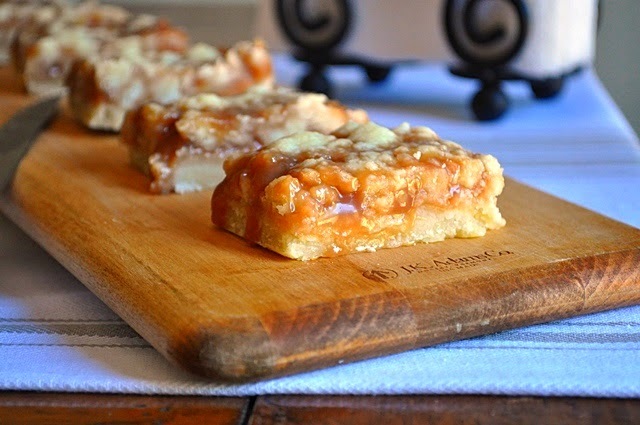 Take the remaining dough out of the refrigerator and crumble it over the top of the caramel. Place the baking dish back into the oven and cook for 30 minutes, or until top is firm. Cool completely before cutting. I stored mine in the fridge, but you don't have to. Happy Memorial Day weekend everyone! Hope you will have nice weather and get to enjoy some good times with family and friends. 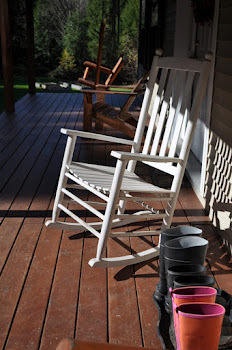 We started our weekend with two of the grandkids spending the night, which is always a delight. I just love cooking for company, even the little ones! 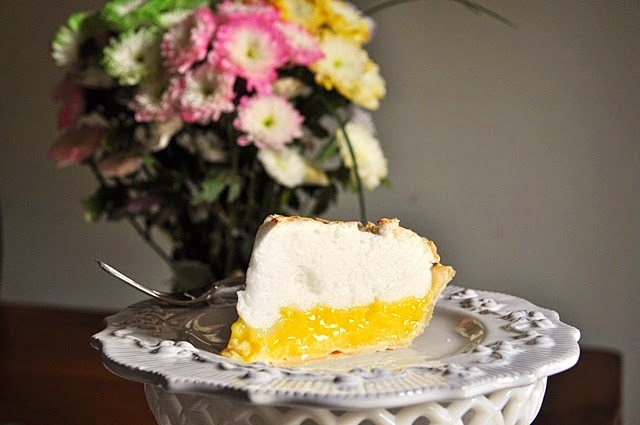 I actually made this lemon meringue pie for Easter as a treat for my husband and son. They both have mentioned to me on several occasions how much they like it, but I politely ignored them for a long time. 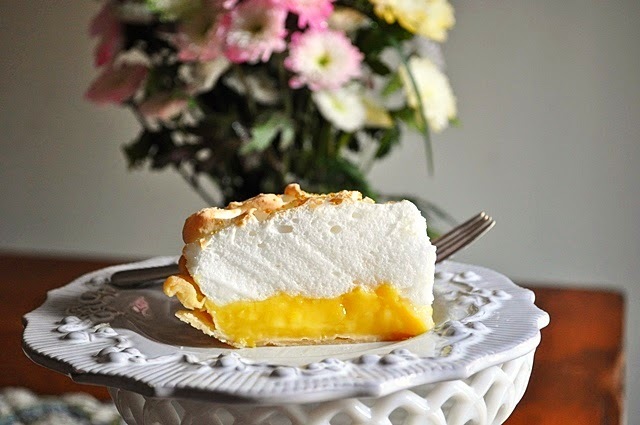 For me, lemon meringue pie has never been my thing, and I've certainly never made it before. However, I like to challenge myself, so I decided Easter was the perfect time to give it a try for my two most favorite boys. I have to admit that I was very surprised at how much I actually liked this pie....I really didn't think I would, but it was absolutely delicious! Such a light and refreshing dessert - what more could you ask for!?! I am sold on this pie and will definitely be making it again. What a nice surprise. Filling: Preheat oven to 325°F. Bring the water, sugar, cornstarch and salt to a simmer in large saucepan, whisking constantly. When mixture starts to turn translucent, whisk in egg yolks, two at a time. Whisk in lemon zest, juice and butter. Return mixture to a simmer, then remove from heat. Lay sheet of plastic wrap directly on surface of filling to keep warm and prevent skin from forming. Meringue: Bring water and cornstarch to simmer in small saucepan and cook, whisking occasionally, until thickened and translucent - about 1 to 2 minutes. Remove from heat and let cool slightly. Using a stand mixer fitted with a whisk, whip egg whites, vanilla, and cream of tartar on med-low speed until foamy, about 1 minute. Increase speed to med-high and beat in sugar mixture, 1 tablespoon at a time until it forms soft, billowy peaks. Add the cornstarch mixture, 1 tablespoon at a time and continue to beat until it's glossy with stiff peaks, about 2-3 minutes. Meanwhile, remove plastic from filling and return to very low heat during the last minute or so of beating the meringue (you want to make sure the filling is hot). Pour warm filling into cooled pre-baked pie crust. Add the meringue mixture and using rubber spatula, immediately distribute it evenly around edge and then center of pie, making sure to push it to edges to prevent shrinking. Using the back of spoon, create attractive swirls and peaks in the meringue. Bake until meringue is a light golden brown, about 20 minutes. Let pie cool on wire rack until filling is set, about 2 hours. Serves 8. Store in the refrigerator. 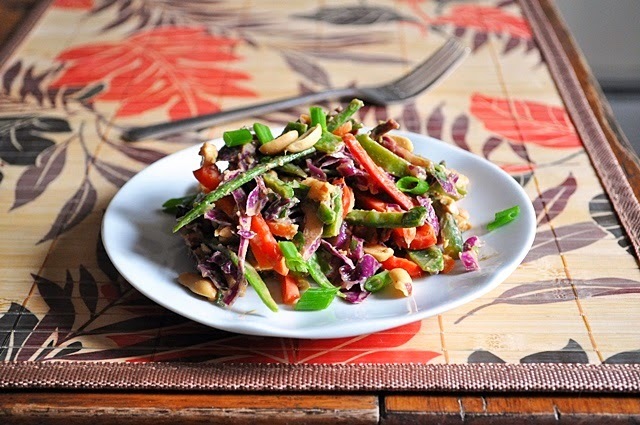 If you don't like Thai food or peanuts, this is not the salad for you! I happen to enjoy both. As much as I love regular salad for lunch, having it every day can get a little mundane. So once in a while I like to switch things up a little. 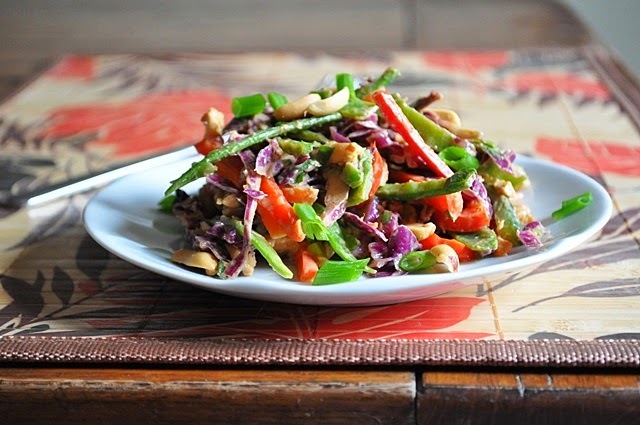 This is what I came up with recently when I found myself in a lunchtime salad rut. Not only is this supper tasty, but it's also great for those looking for a meatless lunch/dinner option. Veggies + protein + tons of flavor = perfect meal! Combine all the salad ingredients in a large bowl. Add the dressing ingredients to the bowl of a food processor and pulse until blended (you don't have to use a food processor, you can whisk together by hand but you'll need to mince the garlic and ginger first). Add the dressing to the salad and stir well to combine. Makes about 4 servings. I will admit that I am pretty much a cake mix food snob. I just don't use them. I much prefer to make cakes from scratch, especially icing/frosting, because the flavor is just so much better. The icing/frosting you buy in those containers at the store actually taste like plastic to me, yuck! However, I know not everyone has the time or ability to make a cake and icing from scratch, so I'm not judging. 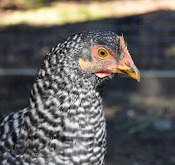 Over the years I've come across several recipes for "dump cakes". You've seen them too right? The gist of it is that you combine a dry cake mix with some cooked fruit, and the result is sort of like a fruit buckle. While my son was on spring break last month I wanted to make something for him to munch on during the week while I was at work. However, I didn't have much time, so that's when the light bulb went off - make a dump cake. Perfect opportunity to see if they were any good, and if nothing else it would still give him something to snack on. I chose to use a pineapple upside down cake mix (without the pineapple part). I wanted to use a coffee cake mix but I couldn't find one at my grocery store. Don't they sell those? Anyway, I thought this turned out pretty good. I still prefer homemade, but this was good and definitely easy. 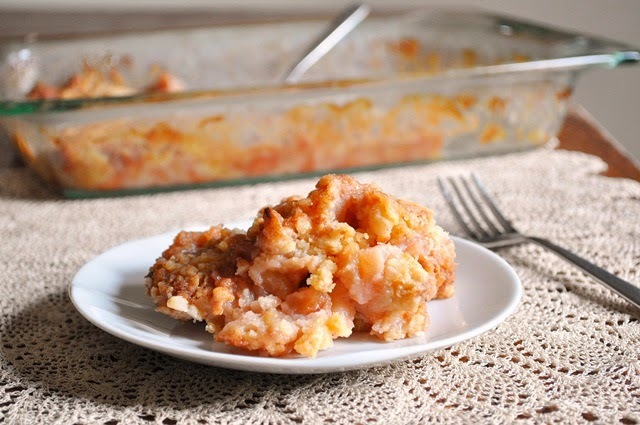 If you've never made a dump cake before, I would recommend giving it a try. With all the cake mixes out there you can definitely get creative! Preheat oven to 350. Peel, core and chop your apples and place them into an 8x10 baking dish that you have sprayed with cooking spray. Mix in sugar, cinnamon, nutmeg and lemon juice. Cook apples for 20 minutes, then remove from oven. Drain most of the juice from the baking dish, leaving about a quarter of the amount still in the dish. Spoon about 1 tbsp of the remaining juice into a small bowl, and whisk in the cornstarch. Add the cornstarch mixture back into the cooked apples and stir to combine. Once in a while my lovely husband will suggest I make something in particular. 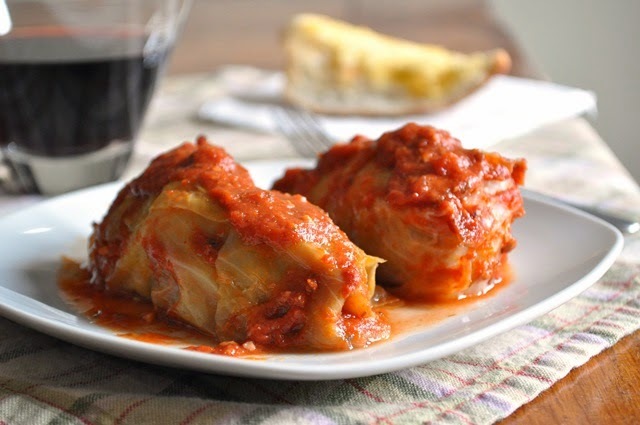 Over the years he has mentioned how much he loved his mother's stuffed cabbage rolls, and I would make a mental note to try making them sometime in the future but would eventually forget about it. I had never even tried a stuffed cabbage roll, so the prospect of making something I've never actually tasted before is a little daunting. I mean, if you've never tried it how are you supposed to know what it should taste like? I will also admit that stuffed cabbage rolls seemed like an outdated type of recipe...I mean, you don't exactly see it on menus at restaurants. It just seems like one of those recipes people just don't make much anymore. 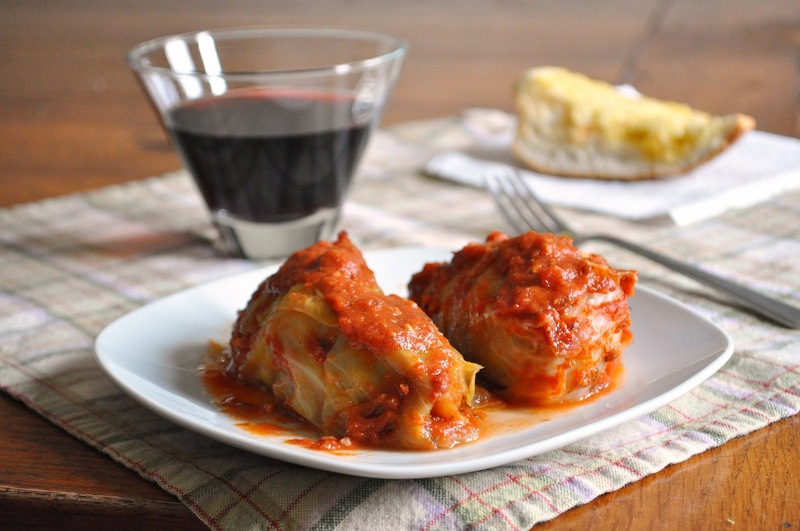 A few weeks ago, out of the blue my husband said "Let's make stuffed cabbage rolls." So I said OK, but explained my thought process on the subject, and he said "Don't worry, we'll do it together. 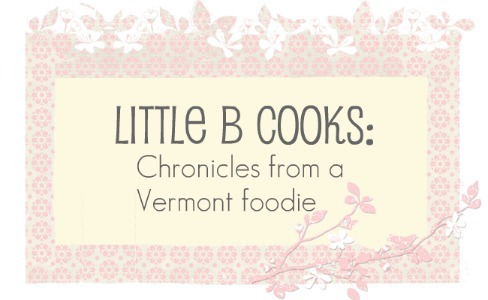 I know how they are supposed to look and how they should taste, so between the two of us we'll figure it out." He enjoys cooking, but for the most part leaves it to me. However, I really do enjoy the times we cook together. We work well together in the kitchen, and so making these cabbage rolls was actually fun for both of us. They turned out to be just fabulously delicious. I was quite surprised by how much I liked them. I can't believe I've spent all these years missing out on such a yummy healthy meal! No longer do I feel like this is an outdated dish. In fact, it needs to make a comeback! Try these people. I'm positive you won't be disappointed. Drizzle about a tbsp of olive oil into a small saucepan, and heat on medium-low. Add the chopped garlic and saute for 2 minutes. Add the can of crushed tomatoes, wine, sugar and parsley and stir well to combine. Simmer sauce for about 15 minutes, then remove from heat and stir in cup of tomato soup and set aside to cool a little. Fill a large pot with water, add 1 tbsp of salt and bring to a boil. Add the cabbage and boil for about 4 minutes. Remove cabbage, rinse in cold water and set aside. Preheat oven to 350. Spray a 9 x 13 baking dish with cooking spray, and put about 1/2 cup of sauce into bottom of dish and spread around evenly. In a large bowl add your beef, cooked rice, egg, onion, salt & pepper and 1/4 cup of the sauce mixture. Mix everything together gently, and divide into 10 equal parts (you don't have to actually do this physically, but just kind of divide it up in the bowl so you have a general idea of how much to put in each roll). Lay one cabbage leave flat and add 1/10 of the meat mixture to the center of the leaf. Fold the two end sides up, then roll it up completely (like you would a burrito) and place in a 13 x 9 baking dish, seam side down. Repeat until meat mixture is used up - it should make 10 rolls. Pour remaining sauce all over the top, and cover the pan with tin foil. Place in preheated oven and cook for about an hour, or until meat is cooked through.